I recently wrote a piece about the impact of table and column aliases on query performance and plan cache size. As I was writing the post, I recalled that there are multiple ways in which column aliases can be defined in a T-SQL query, depending upon the developer’s preference. However, one of these methods is marked for deprecation in one of the future releases of Microsoft SQL Server (it is still a valid method for SQL Server 2012, so there is no cause of worry in the immediate future). I personally use either expression AS [column_alias] OR [column_alias] = expression methods. Before you leave, do share your preferred format for column aliasing. 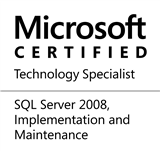 This entry was posted in #SQLServer, Blog, Imported from BeyondRelational and tagged #SQLServer, #TSQL, Best Practices, DBA, Development, Guidance on June 18, 2012 by nakulvachhrajani. Thank-you, Madhivanan! That’s a very comprehensive collection of methods that can be used for column aliasing. Also, thank-you for sharing your preferred method of aliasing. The expression AS [column_alias] has to be the most widely used method for aliasing.